Glee star, Naya Rivera, arrived at the 2013 VMA’s looking like a hotter (much ho..
Glee star, Naya Rivera, arrived at the 2013 VMA’s looking like a hotter (much hotter) version of both Kim Kardashian and Morticia Addams. She donned a simple middle part dark wavy hairstyle with her noir cut out Sen Couture gown. Exquisitely vampish! 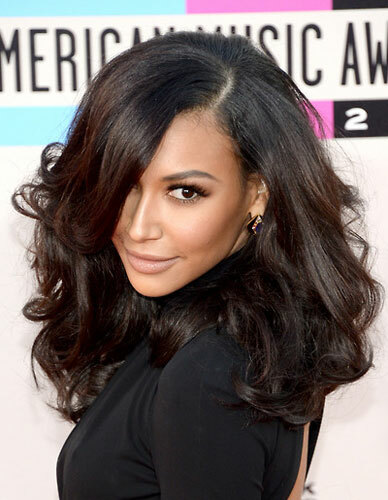 Naya Rivera’s long brown hair is styled in a half up – half down hairdo. The top..
Naya Rivera’s long brown hair is styled in a half up – half down hairdo. The top section of hair is braided in a tight French braid. The rest of hair is left down and straight to create this fun and flirty summer look.